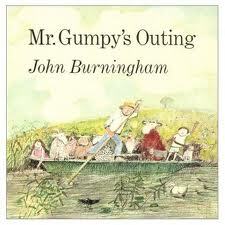 Mr. Gumpy’s Outing by John Burningham | The Loudest Librarian! Last week, Ella, one of my regular storytime patrons, asked if she could read a Bob book about Outdoor Adventures at storytime. So I based last week’s Family Storytime on that theme. Unfortunately, Ella wasn’t able to come, but I still had fun sharing outdoor adventure books. 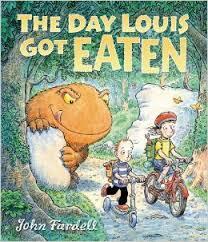 When Louis gets unexpectedly eaten by a Gulper, his sister, Sarah, sets out to rescue him. Unfortunately, just as she gets close, the Gulper is eaten by a Grabular, who is eaten by an Undersnatch. Sarah is undaunted. Pursuing the creatures on a bike that magically transforms to suit the terrain, she saves the day with the help of a hiccup frog. The whimsical illustrations in this book are always a hit. Fun, simple story about a man whose boating outing is complicated by all the animals who want to come along. The kids enjoyed joining in on the animal noises. This one is also fun for kids to act out. Sweet story with beautiful illustrations. When a frog gets trapped in their swimming pool, Little Joe, who can’t swim, watches as his family tries frantically to get it out. 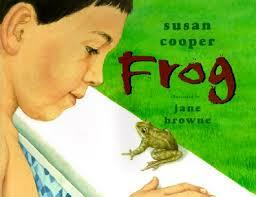 But it is Little Joe who quietly comes to the rescue, and, inspired by Frog, finally learns to swim. While visiting the zoo with his parents, a little boy is carried off by a red balloon to a perilous adventure in the jungle. Each page reveals a new part of the story followed by a refrain of “That’s good! No, that’s bad!” Or, “That’s bad! No, that’s good!” which the kids quickly learned to repeat. Don’t forget to roar! ROAR! Don’t forget to scream! AAAAAHHHH! Eating the most delicious bugs! Yum Yum! Four green and speckled frogs…etc. Great big ears and a long trunk swinging. See all the monkeys, they’re scritch, scritch, scratchin’. Jumping all around and scritch, scritch, scratchin’. Sitting in the car getting sleep, sleep, sleepy. ‘Cause we have stayed all day! We’ve been to the zoo, zoo, zoo! So have you, you, you! You came too, too, too! 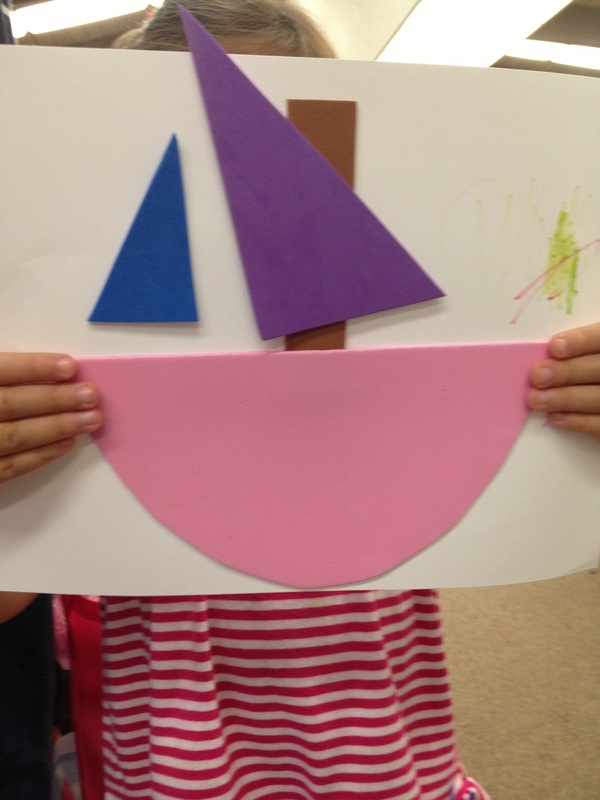 I got this simple craft idea from DLTK-kids.com: http://www.dltk-kids.com/crafts/transportation/mhalvesboat.html I had some colored foam sheets that I used to cut the shapes out, but you could do it just as easily with construction paper or card stock. I made a mix of colors for the kids to choose from, and gave them markers to decorate if they wanted. 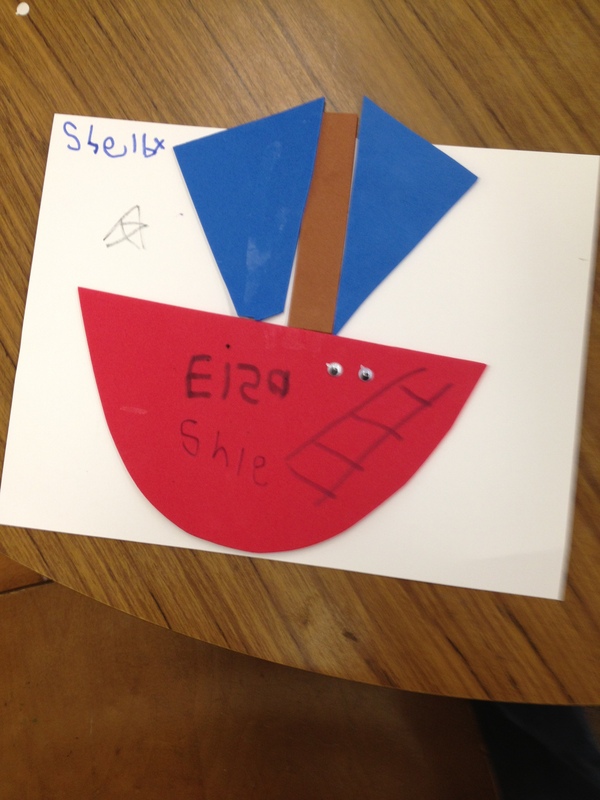 They each made their boats a little differently. 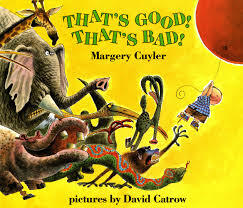 I don’t often “read” wordless books at storytime, but I have shared this one several times and the kids always love it. A beautifully illustrated story about a lonely girl with a magic red crayon who draws her way into another world to find adventure and a new friend. Reminiscent of Harold and the Purple Crayon, which would also fit the theme. An older book I love that reminds me of That’s Good! That’s Bad! This one is about a boy who is trying to get to a surprise party. Unfortunately, the party is in Florida and he is in New York. Fortunately, he borrows a plane from a friend. Unfortunately, the engine explodes. Fortunately, he has a parachute. You get the picture. The third book in the picture book series about Eddie, his teddy Freddy, and the big bear who lives in the woods. They are all funny rhyming stories with large colorful illustrations, but this is the sweetest one, where the bear thinks his teddy bear can talk (because Eddie is hiding behind it), and Eddie and the bear end up becoming friends. What are your favorite picture book adventure stories?